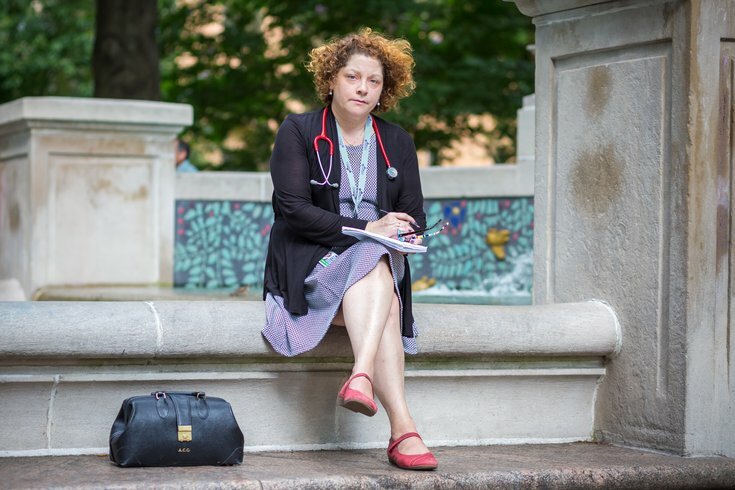 Dr. Amy Goldstein, clinical director of the Mitochondrial Medicine Center at Children's Hospital of Philadelphia, often works on her writing near the fountain in Rittenhouse Square. Here, she pauses while working on a poem about Charlie Gard, the British infant who died recently after fighting mitochondrial DNA depletion syndrome. In 1996, Dr. Amy Goldstein was a pediatric intern at Mercy Hospital of Pittsburgh when a devastating night in the neonatal intensive care unit taught her the healing power of poetry. A premature baby had suddenly coded and ultimately died despite efforts to resuscitate. Afterward, Goldstein sat in the NICU with all sorts of feelings bubbling up that she didn’t know what to do with. Help us out: This week we are challenging Hahnemann University Hospital to nominate staffers with a side story to tell. Send us a tip via email. When her attending came in the next morning, Goldstein gave her the poem to read. “She started crying and said that she couldn’t believe that I put into words exactly what she was feeling, that I captured the moment beautifully with my words,” Goldstein recounted. Goldstein, the new clinical director of the mitochondrial medicine frontier program at Children’s Hospital of Philadelphia, has continued to use poetry to encapsulate the powerful interactions she has with patients and their families. Recently Goldstein published a collection of her poetry called Bearing Witness, a title chosen to acknowledge that a doctor's role is not to just take care of people, but to bear witness to their suffering and pain. Many of her poems focus on children with whom she has had long relationships, or about tragic events that have made a big impact on her. One poem, “little red flag,” is about a seven-year-old boy who came into her clinic with some neurological symptoms. “I had to send him for a CAT scan of the head and in my mind I already pretty much knew he had a tumor, but his parents had no idea why I was sending him for it. At least I didn’t verbalize it," she recalled. “There was this small moment where I knew why I sent him and what I was going to find, but the parents had no idea because I wanted them to have this time, these last few moments of normalcy in their lives because pretty soon I was going to have to give them this horrible news and their world was going to turn upside down,” she said. And held his mom as she sobbed then screamed in my arms. I held her and said yes you can. I will never see them again. “It was the most intense moment you can have with another human being. 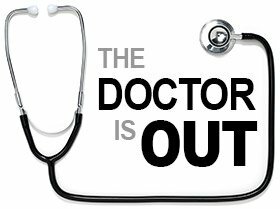 You have to be completely available for that family and then go on to the next patient in the next room and do it all over again,” she said. Because she derives inspiration from experience, Goldstein may not write for several months at a time and then may write three poems in short order. While in the throes of the creative process, she doesn’t follow any certain structure or rhythm, instead relying on her emotions to guide her. It is the rawness of her poetry that resonates with many readers. “It has become a real effortless thing. The words just kind of arrive in my brain. And what I have learned over time is that if I don’t write it down right then I might not get those words back later. For me it became really spiritual, almost very magical,” she said. Goldstein, now 50, has only been with CHOP for a little over a month so her collection of poetry was drawn from her time in Pittsburgh, where she most recently was director of neurogenetics at the Children’s Hospital of Pittsburgh. Pittsburgh is where she really began cultivating her art, taking poetry classes at the Pittsburgh Center for the Arts with poet Michael Wurster, who who runs the Pittsburgh Poetry Exchange and began reading her work at open mic nights. Wurster encouraged her to publish her poems. While in Pittsburgh, she also joined Madwomen in the Attic, a writing workshop group out of Carlow University, where she attended workshops and connected with a publisher that helped her self-publish her work. “It was really important to me at the midpoint of my career to publish my history of medicine in Pittsburgh,” she said. Goldstein said that as she gets settled into her new home in Center City, she hopes to attend some open mic nights and find the poetry people here so she can continue to write.